Research Team in India Uses 3D Software and 3D Printing to Make Prosthetic Ear - Robolab Technologies Pvt. 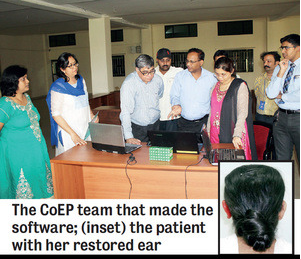 Ltd.
As part of a college program, a team from the College of Engineering, Pune (CoEP) in India has developed unique software, which helped them make a 3D printed ear in just one week for 32-year-old Rucha (not her real name) from Kondhwa. Typically, it takes about a month to make an artificial ear, but thanks to the newly developed Osto3D software that the CoEP team developed, that fabrication time was greatly reduced. The successful auricular prosthesis surgery was performed on Rucha last month, when doctors from the Armed Forces Medical College (AFMC) attached the artificial ear. The team used CoEP’s 3D Make Lab for the project, a public access facility for 3D printing and other advanced technology. Students and companies can use the 3D tools in the lab to build on creative concepts and research; the 3D Make Lab focuses on several different areas of research, including Biomedical Applications. Artificial ear team members Vikas Chougule, a PhD candidate, and Arati Mulay developed the Osto3D interface, which converts CT scan data into 3D BioCAD models; the models are then 3D printed at the 3D Make Lab. Innovative software, like Osto3D, and medical devices manufactured in the 3D Make Lab are helping to reduce the time and cost usually required for medical procedures, and making artificial body parts more affordable. The Osto3D software was developed after the team discussed necessary surgical requirements with doctors, and how much time is generally needed to convert CT scan data to 3D biomodels. The software uses raw CT scan data from hospital facilities – the data files are simply uploaded to the software, which uses advanced image processing algorithms that were developed in-house to convert the CT images into point cloud data. Using CAD techniques, the points are fitted with a smooth, accurate surface, and the data is then exported as STL files. Two different case studies were conducted with the Osto3D interface: surgical guides developed for Minimally Invasive Spine Surgery (MISS), which were used in scoliosis surgeries in association with Walawalkar Hospital, and the 3D printed ear for Rucha. In addition to Chougule and Mulay, other team members include CoEP director B. B. Ahuga and Major (Dr.) Abir Sarkar from the AFMC. They used Osto3D to model a new left ear for Rucha, using a CT scan of her right ear. We’ve seen 3D printing technology used in cosmetic surgery to make artificial ears before, in countries like Croatia and Australia. In this case, the Osto3D software helped the team mirror Rucha’s ear in just hours, which helped immensely when it came to creating the prosthetic ear.